New plan…. February is going to be a month of dollhouse building. When I was about 9 years old I was given a wooden dollhouse that my stepmother built. I also received some pieces of wooden furniture to go with the house. Most of the random furniture pieces were the tongue and groove type that you buy flat and assemble yourself, or at least it looked that way. The other day I discovered an extremely inexpensive 35 piece set of tongue in groove furniture on amazon AND an extremely inexpensive corresponding dollhouse kit. 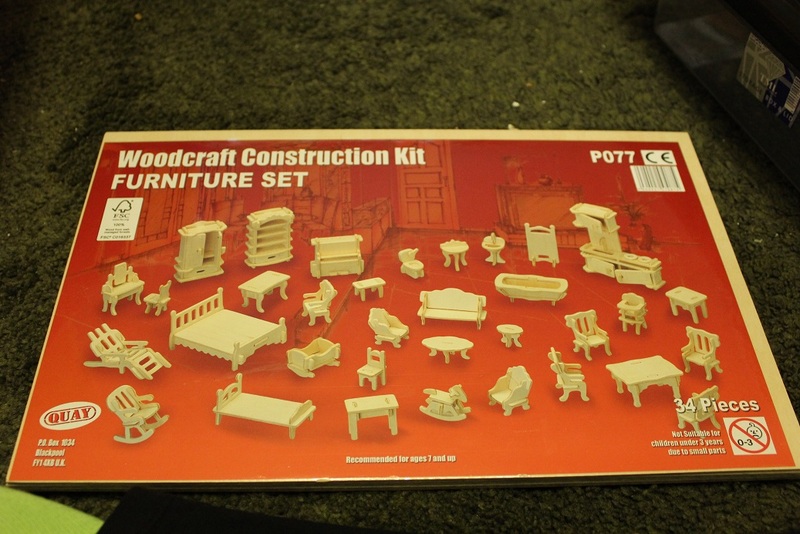 I couldn’t afford to buy both right away so I got the furniture kit first to build and embellish for my daughter. My auntie bought me the house kit too so I’ll be writing about my adventures building and decorating that as well but that will be a different series of posts. Over the next month or so I plan to record how I’ve transformed each piece of furniture by embellishing and customizing the basic designs. At the moment my plan is to do blog entries for each room of corresponding furniture. At the moment I have all of the furniture pieces built up without glue. It took me about 3 hours to build them all but if I wasn’t watching tv and snacking at the same time It probably wouldn’t have taken me so long. The kit comes with four sheets of wood with all the pieces punched in (like a puzzle), an instruction sheet on the reverse of the photo of the built up furniture and a tiny square of sand paper so that you can smooth away any rough edges. 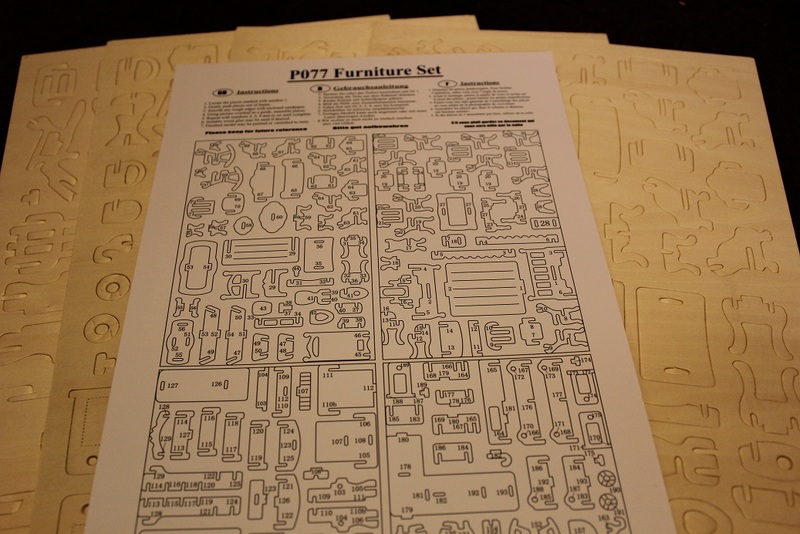 The photo of the furniture pieces and the numbered instructions are extremely clear and with a little careful attention and glue I think it really is a wonderful kit for functional dollhouse furniture that is meant to be played with which is exactly what I wanted so I am really excited about making it all up. some of the pieces popped out with little splinters but the sand paper took care of that issue. I was very impressed that all of the pieces actually lined up with the holes exactly the way they should because in my experience kits like these often require quite a lot of work to force the pieces to fit together. My husband suggested that the introduction of laser cutters has probably helped with that a great deal in terms of precision. The only things that I had to work at were the doors on the wardrobe and the kitchen (sink/stove) piece. If I didn’t want the furniture to be functional it would have been fine because the only problem was really that the doors were too stiff to open and close easily. Since I want my daughter to be able to play with this furniture it was something that I had to fix and I solved the problem by just sanding the doors down a tiny bit, making them looser and now they’re perfect.